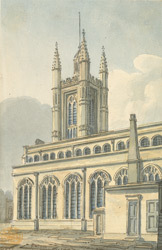 In 1614 St Margaret's became the parish church for members of the House of Commons and since then has had connections with many great parliamentarians. In 1734, the walls of the sixteenth-century church were lined with Portland stone and the tower was rebuilt by John James. The 16th original east window was reinstalled in a neo-Gothic apse in 1758. Since then, the church has been frequently repaired and restored.